Seeing how chicken is supposed to be a healthy source of high-quality nutrition, the fact that it has become so affordable might seem to be a great benefit. But there’s a major flaw in this equation. As it turns out, it’s virtually impossible to mass-produce clean, safe, optimally nutritious foods at rock bottom prices. An example of a poultry CAFO can be seen in the video above. 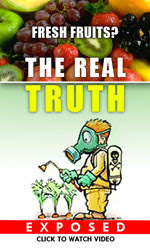 It’s a short clip from the film Food Inc. Sickness is the norm for animals raised in these CAFOs—the large-scale factory farms on which 99 percent of American chickens come from. Those antibiotics pose a direct threat to human health, and contaminate the environment when they run off into lakes, rivers, aquifers, and drinking water. According to a landmark “Antibiotic Resistance Threat Report” published by the CDC,2 two million Americans become infected with antibiotic-resistant bacteria each year, and at least 23,000 of them die as a direct result of those infections. “Chickens have nervous systems similar to ours, and when we do things to them that are likely to hurt a sensitive creature, they show behavioral and physiological responses that are like ours. When stressed or bored, chickens show what scientists call ‘stereotypical behavior,’ or repeated futile movements, like caged animals who pace back and forth,” Cornucopia writes. “Tyson produces chicken cheaply because it passes many costs on to others. Some of the cost is paid by people who can’t enjoy being outside in their yard because of the flies and have to keep their windows shut because of the stench. Some is paid by kids who can’t swim in the local streams. Some is paid by those who have to buy bottled water because their drinking water is polluted. Some is paid by people who want to be able to enjoy a natural environment with all its beauty and rich biological diversity. In part because their nutrition is inherently inferior; in part because they’re contaminated with antibiotics; and in part because they raise your risk of contracting a foodborne illness. Most recently, Foster Farms and Kirkland chicken brands issued recalls4 for Salmonella contamination that has affected hundreds of consumers across America since March 2013. CAFOs represent a corporate-controlled system characterized by large-scale, centralized, low profit-margin production, processing, and distribution systems. It’s important to realize that the factory farm system is NOT a system that ensures food safety and protects human health. On the contrary, it makes the food system far more vulnerable to pathogenic contaminations that have the capacity to kill—both the livestock, and the people who eat them. For example, over the past year, nearly 10 percent of the entire swine population in the US has been wiped out by a highly lethal virus called Porcine Epidemic Diarrhea virus (PEDv), which has been—at least in part—traced back to pig’s blood used in piglet feed. In this case, the virus does not affect humans. But it’s a valuable demonstration of how fragile the system becomes when you veer too far from the natural order of things. Besides everything mentioned already, the factory feeding model also involves the mixing of animal parts (in this case, blood) from a large number of animals, which is then fed to large numbers of animals—the meat from which in turn are again mixed together in large processing plants, before it’s ultimately sold in grocery stores across the nation. All this mixing and cross-contamination allows for pathogens to contaminate huge amounts of food products, and is the reason why a single food contamination can spread so far and wide, affecting people across multiple states. Processing plant (i.e. plants where meat is cut or milk is pasteurized, for example) are primary culprits when it comes to the spread of pathogens. Due to regulations, traditional farmer-to-consumer practices have been outlawed. Now processors run the show and cut out the farmer’s share, which has decimated small farmers and created this industrialized, disease-promoting mess. The weaknesses of the factory farm model are usually overlooked during food safety discussions. Instead, small-scale raw foodproducers—and raw dairy producers in particular—are targeted and vilified as sources of dangerous pathogens that threaten human health. Such attacks are completely out of order and do nothing to improve food safety on the whole, as the PRIMARY sources of pathogenic contamination actually originate in CAFOs, large-scale butchering and processing plants, and processed food manufacturing plants, where multiple ingredients are mixed together. If food safety, optimal nutrition and disease prevention really matters, the way forward is to shift into a socially responsible, small-scale system where independent producers and processors focus on providing food for their local and regional markets. This alternative produces high-quality food, and supports farmers who produce healthy, meat, eggs, and dairy products using humane methods. And it’s far easier on the environment. True free-range chickens and eggs come from hens that roam freely outdoors on a pasture, where they can forage for their natural diet, which includes seeds, green plants, insects, and worms. Keep in mind that when it comes to labels such as “free-range” and “natural,” there are loopholes that allow the commercial egg industry to call eggs from their industrial egg laying facilities “free-range,” so don’t be fooled. By far, the vast majority of food at your local supermarket comes from these polluting, inhumane farm conglomerations. If you want to stop supporting them, you first need to find a new place to shop. Your best source for pastured chicken (and fresh eggs) is a local farmer that allows his hens to forage freely outdoors. If you live in an urban area, visiting a local farmer’s market is typically the quickest route to finding high-quality chicken and eggs. Again, free-range pastured chickens should be allowed outside, and to eat insects. To see how this looks in the real world, please watch my video below with farmer Joel Salatin.